*Sigh* Another gorgeous moth for all to see ( at least in photos ). I certainly wish I could see one in person along with the Luna moth ( Actias luna ). But until then I'll be left fantasizing about these gorgeous moths. 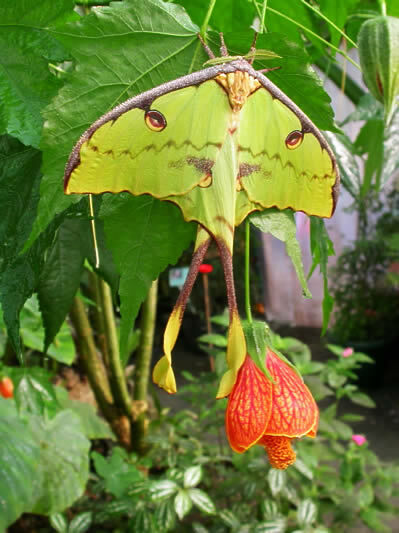 The African moon moth (Argema mimosae) is a giant silk moth of the Family Saturniidae. Similar in appearance to the Giant Madagascan Moon Moth (Argema mittrei), but smaller, this moth can be found near the east coast of South Africa. An adult can measure 10-12 centimeters across its wingspan, and 12-14 centimeters from head to the tip of its elongated 'tail-like' second pair of wings. Its forward wings have a distinctive grey-colored 'furry' leading edge, giving a very rough surface, presumably for aerodynamic reasons. Apart from the eye-like markings on its wings, the colouring and shape of the wings give the appearance of a piece of foliage, especially the 'tail-like' structures of the rearmost wings which resemble a dried out leaf stem - presumably for camouflage in its natural environment. So now you know something about them. Should anymore info choose to reveal itself I will post it here. I'd like to know more about them myself. Next up is Argema mittrei ( obviously ).